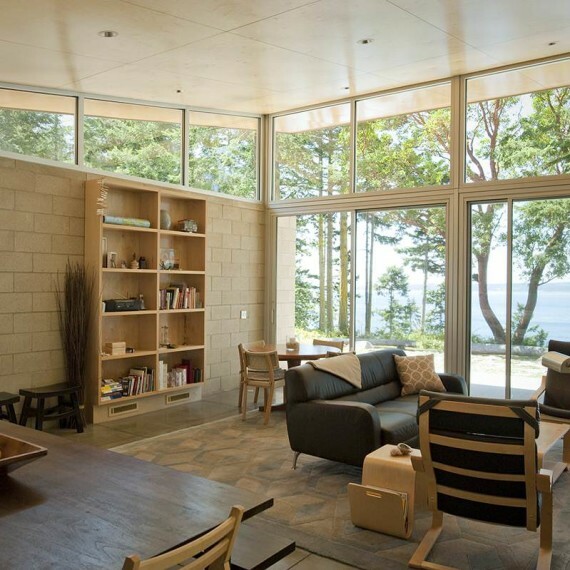 This retreat is located on a wooded bluff high above Puget Sound. A fourteen foot tall glass wall provides uninterrupted views of the water and mountains in the distance. A single uninterrupted shed roof cantilevers dramatically, evoking a sense of protection and blurring the distinction between interior and exterior. Countering the lightness of the roof structure, two thick masonry walls run the length of the home. Two bands of clerestory windows provide an abundance of north and south light.